Preheat the oven to 425°. On a large rimmed baking sheet, toss the pumpkin with 1/2 cup of the oil and the cumin and season with salt and pepper. Bake for about 30 minutes, stirring halfway through, until tender and just browned in s. Let cool. Leave the oven on. On another baking sheet, toss the pepitas with the remaining 1 teaspoon olive oil. Toast for about 7 minutes, until puffed and lightly browned. Let cool. Meanwhile, in a medium bowl, whisk the yogurt with the lemon juice, almond butter, chipotle, garlic and paprika. Season the dressing with salt and pepper. 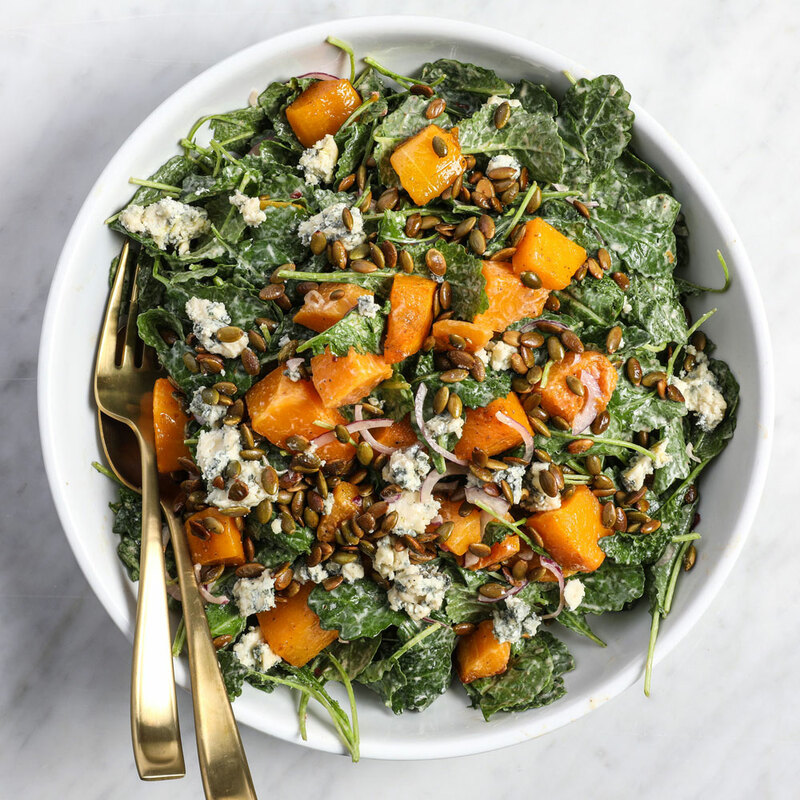 In a large bowl, toss the kale with half the dressing and season with salt and pepper. Fold in the pumpkin and onion. Top with the pepitas and blue cheese and serve, passing the remaining dressing at the table. The dressing can be refrigerated for up to 5 days.